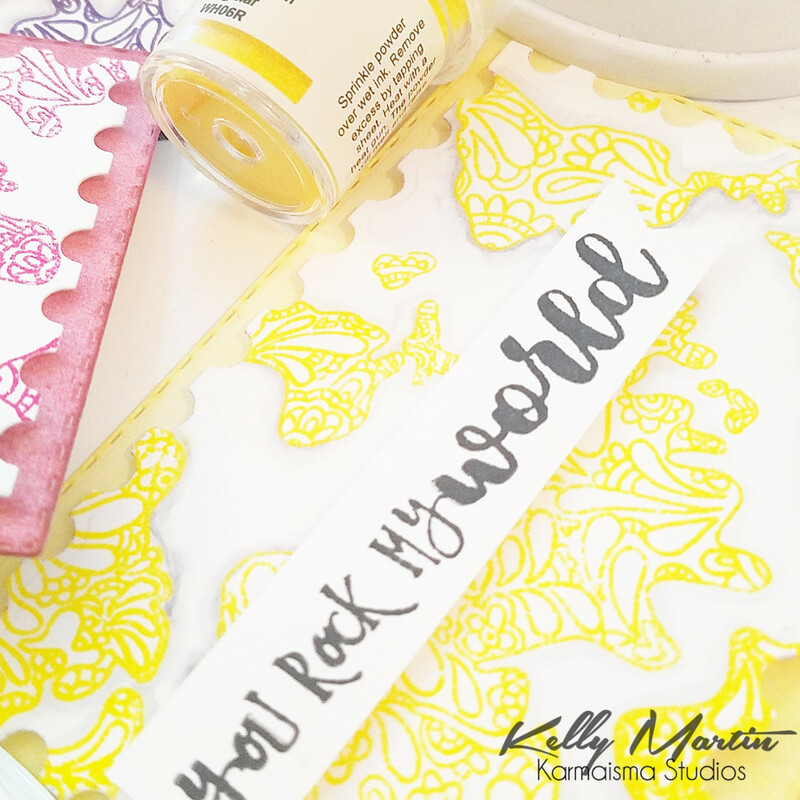 WOW + Stamp of Approval Blog Hop! I'm excited to share today's cards with you as part of a collaboration between Catherine Pooler Designs and WOW. If you're not familiar with either the Catherine Pooler Designs products or the WOW products, you can head here to check out Catherine's shop and here to check out the WOW shop. Today's cards feature a previously released Stamp of Approval collection from Catherine Pooler and some fantastic embossing powders from WOW. I thought it would be fun to create a notecard set for today's project, so I trimmed down some white cardstock pieces to be a little smaller than a 4-bar size. I stamped the images from The World Awaits set in Versamark ink on to my cardstock, and then used various colors of WOW Embossing powder. I heat set the images until the powder melted and then set them aside to let them cool. To give some fun interest to the notecards, I used the Postage Stamp Dies to cut out my cardstock panels. I then cut a few standard 4-bar size cardstock mattes, and used an ink blending tool to apply various Catherine Pooler inks to the edges. I chose inks that coordinated with my embossing powders, and check out the match?!?! Couldn't have planned it any better! I used a gray copic marker to outline and blend out the edges of my embossed images to make them pop off the card a little more. This is a great trick to have in your arsenal if you feel like your card is falling a little flat. Adding a cast shadow with your copics can step up the entire card quite a bit. I then used the same inks and stamped a sentiment from the same set on to a cardstock strip and cut a "v" shape into the end, creating a banner. I popped that sentiment banner up with foam tape and adhered it down to my card. For the bright yellow card, I used a blank ink because I knew the yellow would be just a bit too bright with everything else going on in that card! I glued the embossed card panels on to my larger ink blended panel, and then glued that whole assembly on to a cut and scored 4-bar note card. Thanks so much for stopping by today! We have a some fun prizes lined up for you, so here are the details! WOW is giving away any 6 powders from your choosing along with a WOW carry case to store you powders safely in! Catherine Pooler Designs is giving away 1 set of Life of the Party Inks (Party dress, Tutti Fruitti, Tiara, Tiki Torch, Lime Rickey, Aquatini, Something Borrowed, Flirty Fuchsia). The winners will be chosen at random from the comments left on all the posts of this blog hop. Find out the details of when the winners will be announced over at Catherine's blog. Here is the blog hop lineup! Thanks again for stopping by and happy hopping! I love your color choices. Such pretty cards! Very stunning and very beautiful!! Pretty cards! Thank you for sharing! Fabulous set of cards Kelly. This would make a great gift. 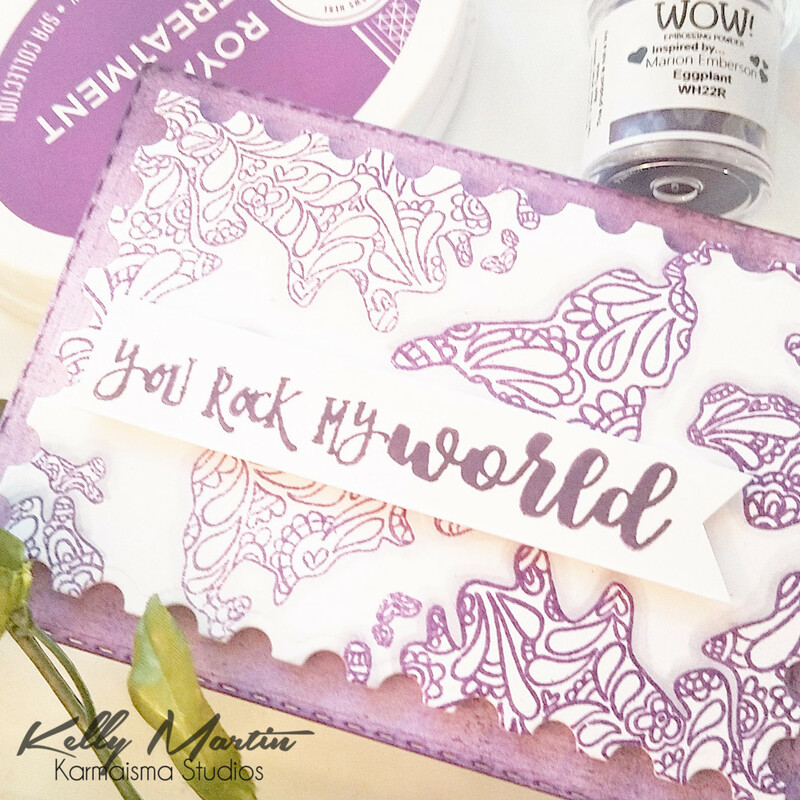 I just love Wow embossing powders teamed up with Catherine Pooler’s products. A match made in heaven. Thanks for the tip on shading - what a great idea! Beautiful set of cards. Thanks for sharing. I like your cards color combos especially the yellow one - thanks! Love that you showed the all of the different color choices in your cards! Love the cards! I love all the different colors! lot's of color and techniques shown, thanks. Sweet and lovely card set. Fun colors and great texture and shine from the embossing powders. The color powder are wow! I love blog hops because they inspire me to create and I learn about products that are new to me--thank you. Nice set of cards. Love the world stamp! So pretty! Thanks for sharing your creations on this fun blog hop!! The use of the postage stamp for the card is a nice addition. Favorite is purple. Cute cards, thanks for sharing. You’ve made some great cards that really give a great idea of WOW Powders quality. Who wouldn’t enjoy your pretty note card set! Awesome! Thank. Beautiful cards. Lovely colors of the WOW embossing powders. OOoooooooh, those colours are GORGEOUS! WOWZERS! Kelly your cards are ah-MAZING! Nice collection of similar cards with lots of WOW! Lovely cards. Thanks for the tip about using the copic for shadow layer around the edge. Very pretty color palette. This is a lovely set! Love getting ideas for this stamp set = very inspiring! Love how you achieved such a pretty and delicate look. Gorgeous cards, Kelly. 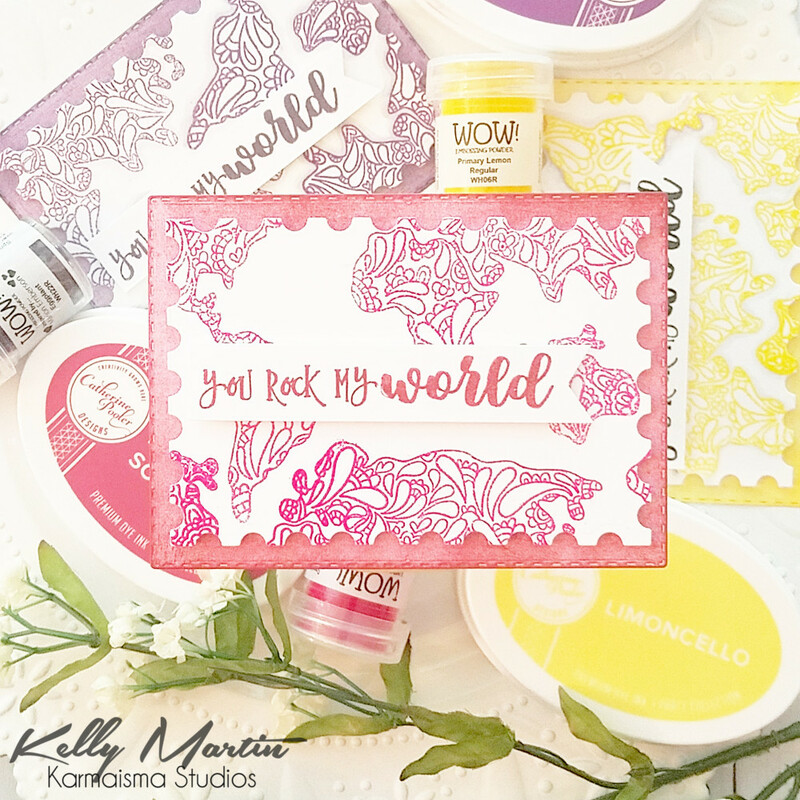 Love the colors combo and Wow embossing powders and CP inks. Thank you for taking part is this amazing Blog Hop. What a great card set! Love the same card - different colors. Gorgeous. I have no idea what 4 bar means...off to google! I love your designs though - such pretty color combinations! I love how well it matches! i think i learned that shading tip from Kelly L. from someone. it does work, doesn't it??? Yes! Sometimes I freak out when I start adding grays to my brightly colored images, but I just have to take a deep breath and keep working it, lol! That shading tip is a great idea. Thx. You're cards are very pretty. 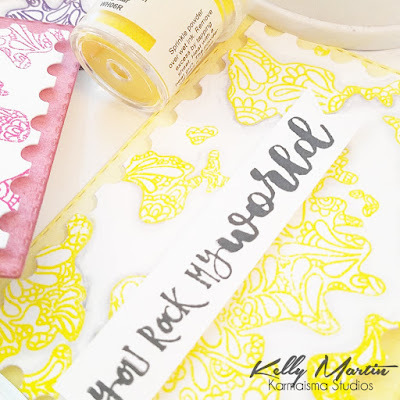 I am in love with the yellow ink and embossing powder! Cute and colorful set of cards. Such a pretty set of notecards! Love the postage stamp die cuts - they add such nice interest to the edges. I love how simple this card is and how it looks great in every color. Nice way to use the World stamp - very pretty. Great colors used on your set of cards. Very pretty. use for the continent stamps. These are just gorgeous. What a wonderful set ! Beautiful card with a lovely sentiment. Thanks for sharing your creativity. Love all the bright summery colors you used for your beautiful cards! Thanks for the inspiration! Sunny with a Side of Sparkle Blog Hop!